Put the pedal to the metal and head out for winter fun. STABILicers Heel cover the critical heel zone and are ideal for driving vehicles or pedaling your fat-tire bike, while giving you critical stability in ice, snow, and all winter terrain. The fully integrated Tension-Fit Binding secures the device firmly to boots and shoes. The heel-only design is lightweight and extremely durable, they're easy to take on and off, and store in a glove box or coat pocket - season after season. At STABIL, stability, traction and performance are more than just product attributes; they're words we live by. Every day. Only through stability can a company earn the trust of its customers. Only through traction can our hard work and efforts be realized. And only through the performance of our dedicated employees can we all prosper. STABILHEEL: Put the pedal to the metal and head out for winter fun. STABILicers Heel cover the critical heel zone and are ideal for driving vehicles or pedaling your fat-tire bike, while giving you critical stability in ice, snow, and all winter terrain. EASY WEAR: The fully integrated Tension-Fit Binding secures the device firmly to boots and shoes. The heel-only design is lightweight and extremely durable, they're easy to take on and off, and store in a glove box or coat pocket - season after season. 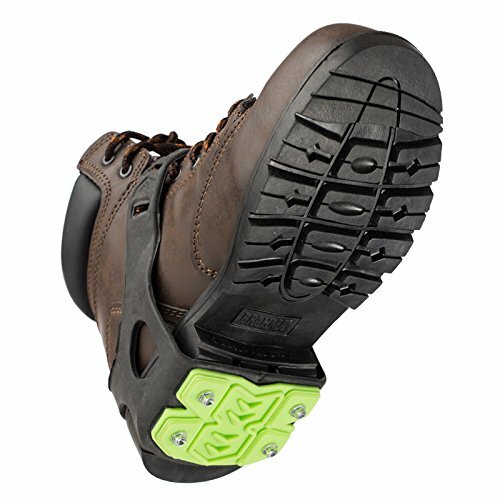 VERSATILE: The heel-only design is ideal for driving or when the job calls for repeated indoor/outdoor transitioning. A fully adjustable strap allows for one size to fit most shoes and boots. Cleats are replaceable for long-lasting performance and value. LIGHTWEIGHT: Proprietary Thermo Plastic Elastomer combines the flexibility of rubber with the lightweight durability of plastic. The innovative design delivers superior traction while keeping the forefoot cleat-free.